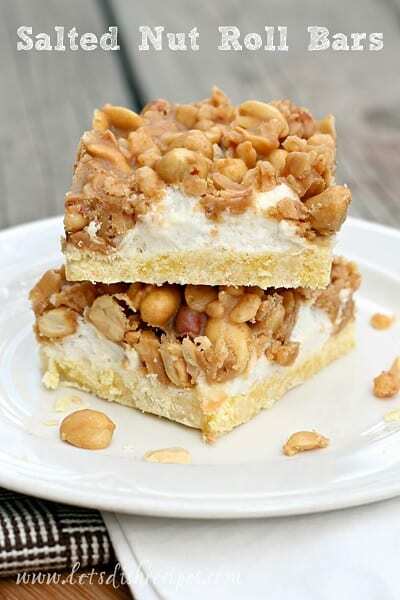 If you love sweet and savory treats, you’re going to love these Salted Nut Roll Bars. 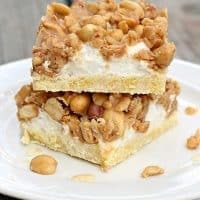 I admit, I’m always a bit skeptical of copycat recipes, but these tasted really close to the Salted Nut Roll candy bar. Even if they didn’t, they’re still fantastic–the perfect combination of sweet, salty, crunchy and chewy. And let’s be honest, I can’t resist anything with a layer of gooey marshmallow filling. You’ll want to put these in the refrigerator to set up, but don’t leave them in too long, or they’ll be hard to cut. That shouldn’t be a problem though, since I can’t imagine anyone not eating them as soon as possible! In a large bowl, combine the peanuts and Rice Krispies. Set aside. In a medium bowl, mix the cake mix, egg and 1/4 cup of melted butter. Press the mixture into a lightly greased 9×13 pan. Bake for 10-12 minutes. Sprinkle the marshmallows evenly over the hot crust. Return to oven for 3-4 minutes, or until the marshmallows are puffy and just beginning to turn golden. In a medium saucepan over medium heat, combine the peanut butter chips, corn syrup and the remaining butter. Heat and stir until peanut butter chips are melted and the mixture is smooth. Stir in vanilla. Pour the peanut butter mixture over the peanuts and Rice Krispies and stir to coat well. Carefully spread the peanut mixture over the marshmallows. Refrigerate until set. Who Dished It Up First: Adapted from Julie’s Eats and Treats. Thanks for posting this recipe. I’ll have to try it. I’m getting the goods to make this today! Reminds me of a Payday candy bar! These did taste like a Payday candy bar! Very rich, very good! What type of peanuts….Spanish? Dry roasted.? You can use whatever kind you like. I just use regular, salted.